On November 29, 2017, Air Lease Corporation announced the delivery of its first Airbus A350 XWB aircraft (A350-941 9M-MAB, msn 159), on lease to Malaysia Airlines Berhad (MAB). This aircraft is the first of six new A350-900s leased to the airline, with the additional five aircraft delivering through the third quarter of 2018 from ALC’s order book with Airbus. We had a little ceremony at our Hangar on November 30, 2017 to welcome the arrival of our new family member. Here are some photos from the event. We can’t wait for you to experience the A350 XWB for yourself! Malaysia Airlines Berhad (MAB) has taken delivery of its first A350-900, leased from Air Lease Corporation, becoming the 17th airline to operate the world’s newest, most modern and efficient twin engine widebody airliner. The delivery was celebrated upon arrival at Kuala Lumpur International Airport. 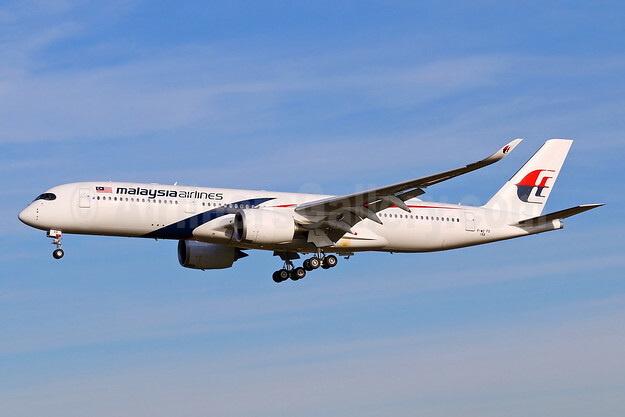 Top Copyright Photo (all others by Malaysia Airlines): Malaysia Airlines Airbus A350-941 F-WZFG (9M-MAB) (msn 159) TLS (Eurospot). Image: 939652. This entry was posted in Malaysia Airlines, Uncategorized and tagged 9M-MAB, Airbus A350-941, F-WZFG, Malaysia Airlines, msn 159, TLS on November 30, 2017 by Bruce Drum.